There are a few common reasons why businesses need to export form entries to a spreadsheet. The most common one is to simply back-up your data, something that we'd recommend all businesses do regularly! Besides backing up data, you might also want to use form entries for other purposes. Having them in a handy spreadsheet means you could do more with them. For example, if you create a online registration form, you could collect contact details in a spreadsheet to make it easier to schedule follow-up calls in the future. The problem is that transferring all the information you need from one app to the other can be incredibly time-consuming. It's also prone to human error (no matter how careful you are) and this could spell disaster if there are missing entries or typos messing everything up. Surely there's an easier way of transferring the information you need between two apps? This calls for the number one modern solution: automation. The beauty of automation is that it removes the time, hassle and errors caused by manually handling data. Why spend all that time manually backing everything up when it can all be handled automatically? Zapier is a program that allows you to connect up all your favorite apps and automate your workflows. Their website claims that Zapier is "Easy automation for busy people." Who couldn't use an app like that? They have more than 1,000 apps available to connect with each other including Trello, Gmail, Asana, social media pages and of course, Google Sheets. When we connect our plugin to Google Sheets through Zapier, Zapier will automatically create a new row or field in Google Sheets whenever a new entry is received in Formidable. This saves you from having to go into Google Sheets and manually add in a new row or field. Zapier works behind the scenes to cut out the middle man. First of all, make sure you've got an account with Zapier or set one up if you haven't. Next, you'll need to install our WordPress Zapier addon which you can find by going through your WordPress admin panel and clicking on Formidable > Add-ons > Zapier. Install and activate Zapier as shown below. Once Zapier is installed, you'll need to connect the two apps through an API Key. 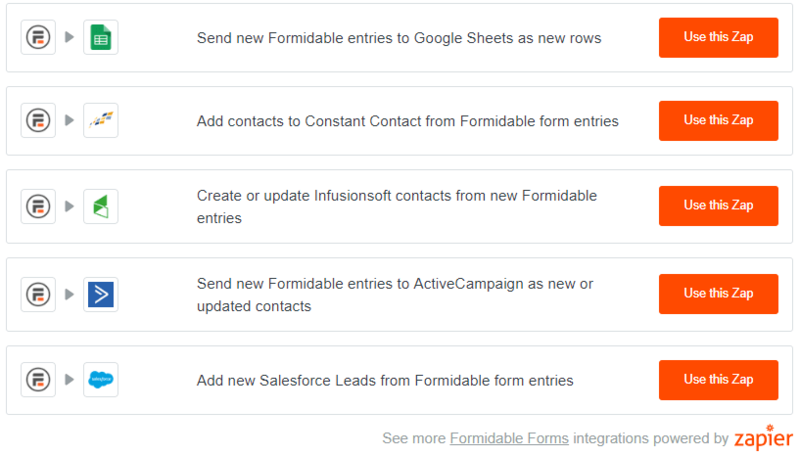 Find your API Key through Formidable > Global Settings > API tab. Head over to Zapier and copy over your API Key and your site URL. All the integrations that Zapier handles are called Zaps. So, for this to work, we'll need to create a Zap that connects Formidable Forms with the app you want to integrate with - in this case Google Sheets. When you log into Zapier, you should see a button at the top of the page that says 'Make a Zap!' Click on this. 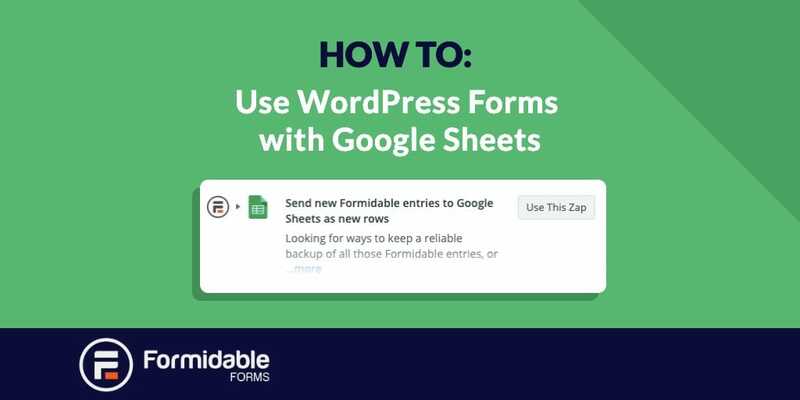 To connect Formidable Forms entries with Google Sheets, you'll need to set a Trigger and an Action. In this case, the Trigger will be Formidable Forms and the Action will be Google Sheets. To choose your Trigger App, go to Zapier's dashboard and search for Formidable Forms. Once this is selected, you'll get a list of possible 'triggers' including 'New Entry' and 'Delete Entry'. Select which one you wish to set up. Once you've set your Trigger App, it's time to tell it what to do. Set up your Action App in the same way outlined above. Once this has been selected you'll again be given a list of options. These will include 'Create Spreadsheet Row', 'Update Spreadsheet Row', 'Delete Spreadsheet Row'. Choose whichever option you need to be triggered by the option selected previously. When you've selected your Trigger and Action apps, you'll now need to tell Zapier what Google account you wish to use. Then you'll need to select the spreadsheet you want to link with Formidable Forms, so that it knows where to direct the new data. Next it's time to map your form fields to specific fields in the spreadsheet. For example, with contact form sign ups, you'll want to match 'First Name' to the 'First Name' column on your Google spreadsheet. 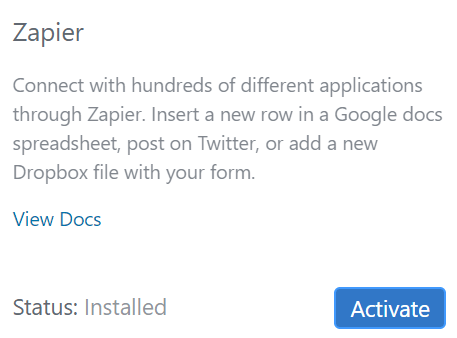 You can do this in Zapier once your Google account and spreadsheet has been selected. We hope this has helped! This is such a simple integration that can save you tons of valuable time and effort. Once little things like this have been automated, you can get back to doing something more worth your time, like growing your business in new ways. For more information on our Zapier add-on and how to troubleshoot any problems, feel free to take a look at our documentation.